Physical Examination of the Newborn at a Glance provides a comprehensive guide for all those involved with both the routine neonatal examination and the more specific full physical examination of a newborn. 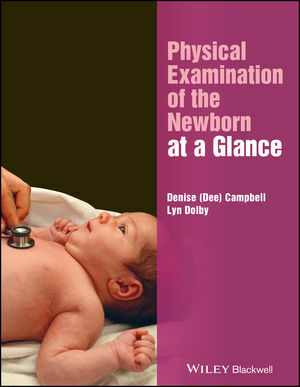 Covering the routine care and the competencies required to perform the examination of the newborn as set out by the Newborn and Infant Physical Examination (NIPE) Screening Programme, this beautifully illustrated book encourages the critical appraisal of personal and practice standards relating to the examination of the newborn in order to promote effective and high quality holistic care of the family unit. Encapsulating the learning requirements across a pre and post-registration audience, Physical Examination of the Newborn at a Glance is an indispensable resource for those beginning their journey to become a NIPE practitioner, as well as those who are looking to update their professional knowledge and understanding. Denise (Dee) Campbell, Principal Lecturer and Programme Lead in Midwifery (retired), University of Hertfordshire, Hatfield, UK. Evelyn Dolby, Senior Lecturer in Midwifery, University of Hertfordshire, Hatfield, UK; Senior Lecturer in Midwifery, University of Northampton, Northampton, UK.